In a new report from Consumer Reports, some fast food chains are following up on their pledge to limit or eliminate antibiotics. Many kinds of meat, such as chicken, pork and beef, often contain at least some antibiotics. This is because farmers want their animals to be fatter and grow faster in what is considered by many to be unhealthy conditions. As a result, society has been eating more meat from animals raised with antibiotics in recent decades than ever before. Shockingly, more than half of the biggest 25 restaurant chains use antibiotics, which has tripled since 2014. But thanks to Consumer Reports, we now know what fast food restaurants are taking the right steps to reduce antibiotics from their food. 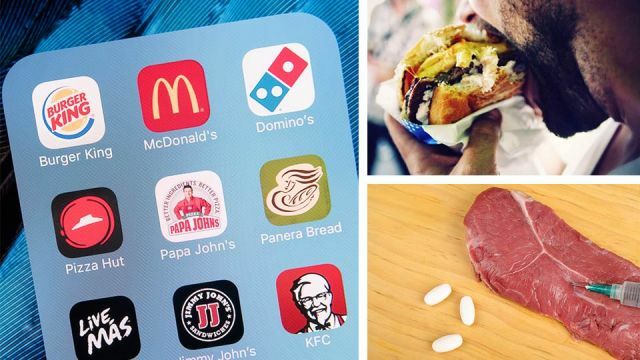 Panera Bread and Chipotle are leading the pack in terms of using meats without antibiotics. Almost all of the animals they derive their meat from are raised antibiotic-free. In fact, Chipotle has a very strong stance on this position. The message has been used in several of advertising and promotional pieces, as seen below. A little lower down the scale, Chick-Fil-A and Wendy’s earned B’s in terms of antibiotic usage. McDonalds claims that their chicken is raised without antibiotics, but they have made no progress on their beef and pork products. Outside of the fast food realm, some popular other restaurants have been even slower to make the adjustment. According to the report, Dunkin’ Donuts, Starbucks, Applebee’s, Chili’s and Dairy Queen have no policies at all when it comes to antibiotic usage. “We’re definitely noticing a shift. Consumers are becoming more aware of the potential dangers of overusing antibiotics,” Calderone said. What are your thoughts on this new report? Will you be more conscious about eating foods raised with antibiotics? Let us know! Next articleThis Alien Video Is Captivating The Internet, But Is It Real? Hey Buddy!, I found this information for you: "Is Your Favorite Food Fast Place Serving Antibiotics? Check This List". Here is the website link: https://www.thealternativedaily.com/antibiotics-in-meat-at-fast-food-restaurants/. Thank you.